Four floors of high specification office space with additional meeting rooms, showroom space and secure parking. The centre's admirable facilities also include an in-house café, showers and excellent technical equipment. The ground floor includes 900 m² suitable for showrooms, the lower ground floor includes 1,340 m² of parking space and the remaining four-storeys include 4,760 m² of high calibre office space of an exceptional standard in terms of both facilities and flexibility. 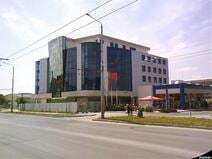 The site is an easy distance from central Varna and the airport and is surrounded by restaurants, shops and bars. This great business park is situated on the Black Sea Coast of Bulgaria in the city of Varna. This centre offers Class A business space, with green areas ideal for taking a break. The city is a popular tourist destination, and well connected to the surrounding area. Local transport links are also superb, with frequent and convenient bus and rail services running throughout the area on a regular basis.